The principle microphone, placed in front of the stage was, like all of the microphones used there, omnidirectional. Whilst probably delivering the best sound quality available at the time, these microphones had the obvious downside of picking up sound equally from all directions, including of course the coughs and other assorted noises emanating from the audience. Removing or reducing audience noise has been one of a number of key priorities here, and special attention was paid to the quiet introduction of the Fourth Symphony, which had been particularly badly afflicted. Although the tapes, which spent many years in Soviet Russia after the war (during which time a number were lost), had done a remarkably good job of capturing the sound of the orchestra and preserving it the direct sound from them was harsh, and lacked in both bass depth and treble expansion. Re-equalisation during XR remastering has done much to improve this, and to reveal far more sonic detail in the recordings than might previously have been apparent. This pair of Pristine Audio releases reflect the work of restoration engineer Andrew Rose. He used XR re-mastering to produce these results in January and February 2011. The material he had to work with was variable in quality. Not surprisingly there remains some occasional fuzziness in the sound but the reduction in background hiss is impressive. The worst coughing and general audience noise has been removed and we are told that much of the fierceness as a result of peak distortion has been effectively smoothed. It’s still not absolutely perfect but Rose has improved sound quality by a significant margin. I have these recordings on other labels but I find them an uncomfortable experience. Any remaining sound problems on the present discs should be tempered by the historical significance of these recordings and by the quite exceptional quality of the live performances. Recorded in the midst of Second World War Berlin, Furtwängler is widely accepted as one of the greatest conductors of the last century. He left a fascinating and substantial audio legacy, mainly from live performances that are cherished by a large and enthusiastic group of devotees. Berlin-born Furtwängler is best known for his long association with the Berlin Philharmonic whom he first conducted in 1917. Succeeding Arthur Nikisch, he became its principal conductor in 1922 at the age of 36 and remained with them until his death in 1954; a tenure only interrupted during the years 1945-47. Blacklisted by the Nazis and fearing arrest he had fled to Switzerland a few months before the end of the war. It was not until 1947 that he underwent successful de-nazification and was permitted to conduct the Berlin Philharmonic again, returning officially as their artistic director in 1950. I was struck by the title that Peter Gutmann uses in the website ‘Classical Notes’, “Wilhelm Furtwängler:Genius Forged in the Cauldron of War”. It encapsulates the complex situation so perfectly. Hitler’s Third Reich under Dr. Joseph Goebbels’ Propaganda Ministry used the Berlin Philharmonic and Furtwängler as the crown jewels in their cultural campaign. Their role and the considerable advantages they gained from working for the Third Reich still divides opinion. Few conductors can have worked in such a severely pressurised situation as he did from 1933 to 1945 - the years of National Socialism in Germany. The concert hall used for the present performances was the Alte Philharmonie on Bernburger Straße, Berlin the home of the orchestra since their first concert there in 1882. A former ice-skating rink, the Alte Philharmonie was destroyed in an Allied bombing raid on the night of the 29-30 January 1944. Preserved here on Pristine Audio the afternoon concert held on the Wednesday 12 January 1944 was recorded just seventeen days before the hall was destroyed. That afternoon Furtwängler was conducting the Berlin Philharmonic in a programme of the Beethoven Violin Concerto with leader Erich Röhn as soloist followed by Richard Strauss’s Symphonia Domestica. Owing to bombing raids the Philharmonie concerts at this time were mainly scheduled in the afternoons and on Sunday mornings. A number of Furtwängler’s wartime performances mainly from the Alte Philharmonie were broadcast live by the state-owned Reich Broadcasting Corporation and recorded on magnetic tape. The sensitive omni-directional microphones in the hall were connected to a small, windowless control room with a signal sent down telegraph wire to the radio transmitter studio where it was recorded on magnetophon tape recorders. Fortunately many of these tapes survived. They were found and seized by the occupying Soviet forces at the studios of the Reich Broadcasting Corporation and taken back to Moscow. Some of the performances were released in Soviet Russia on Melodiya. Thanks to Glasnost the tapes were returned to Germany in 1987. It is these recordings, returned after over forty years in Moscow, that Andrew Rose has used. Although released on various labels I have these Furtwängler mono recordings on two Collectors Edition boxes on Deutsche Grammophon released in 2001. Both titled War Time Concerts 1942-44 volume 1 is a four disc set on 471 289-2 and volume 2 a five disc set on 471 294-2. Much has been written about the sheer individuality of Furtwängler’s interpretations. There is the sheer beauty of the sound, his innate sense of the music’s structure, the incredible energy generated and its towering emotional intensity. His conducting has a sense of spontaneity and I am often surprised at his chosen tempi and the boldness of the dynamics. According Vogt’s list in Kleinert’s book Music at its Best: The Berlin PhilharmonicA Beethoven’s music accounts for nearly 10% of all Berlin Philharmonic concerts between 1945 to 2000. The Symphony No. 4 in B flat major, Op.60 was completed in 1806. Beethoven actually stopped work on the Symphony No. 5 to compose this B flat major score. Dedicated to Count Franz von Oppersdorff who commissioned the score it was first performed in 1807 at the Lobkowitz Palace in Vienna. Overshadowed and neglected to a degree as one of Beethoven’s scoresin a lighter vein, the Fourth Symphony is often judged as somehow inferior to many of his others. Furtwängler clearly liked the score recording it on four occasions once with the Berlin Philharmonic according to Roger Hunt’s valuable Furtwängler discography and concert registerB. PASC 267 offers Furtwängler’s live performance of the Fourth. In the first movement the distinct pastoral accent is underlined. The mysterious colouring develops into anguished sobs. From the tremendous orchestral climax at 3:31 Furtwängler holds the tension at such an elevated level that it becomes almost unbearable. The Adagio whilst seeming relatively calm on the surface has a vein of uneasy emotional anxiety. Marked Allegro vivace the third movement is more of a high energy Scherzo than a classical Minuet. With an abundance of vibrant energy Furtwängler brings out the music’s innate wit to such a pitch that its tales on a sarcastic and almost mocking edge. The watchword in the closing movement is exuberance. In addition there’s a wealth of high spirits and good humour. The final Coda is a fleet-footed dash to the finish line. Beethoven’s Symphony No.7 in A major, Op.92 was begun in 1811 and completed the next year. Dedicated to Count Moritz von Fries it was Beethoven who conducted the première in 1813 at Vienna. Wagner famously described the symphony as the, “apotheosis of the dance.” Out of Furtwängler’s repertoire the Symphony No.7 was the score that he conducted the second most according to Hunt. He recorded it five times of which two were with the Berlin Phil. This recording was made at live broadcasts from the Alte Philharmonie, Berlin at a series of four concerts with the same programme from 31 October-3 November 1943. On this occasion Furtwängler must have been eating raw meat ensuring that the Seventh Symphony commences with incredible force. He maintains a breathtaking intensity and concentration throughout. In the gloomy march of the Allegretto Furtwängler increases the weight and tension whilst always remaining in total control. A substantial passage of a fresh and pastoral outdoor quality provides a splendid contrast. Thrilling, vigorous and witty, the Scherzo just races along. The so-called ‘Pilgrims Hymn’ of the trio is played with noticeable reverence by woodwind and horns leaving plenty of room to breathe. With a whirling sense of unrelenting rhythmic drive the final movement is played with immense power and great reserves of energy. The orchestra shows its remarkable stamina and ability to an elevated level of controlled intensity. Beethoven had to rush to complete his Violin Concerto in D major, Op.61 in time for its first performance given by soloist Franz Clement in 1806 at Vienna. It has become one of the best loved examples in the repertoire. Furtwängler was clearly fond of it:he recorded the work on five occasions three of which were with the Berlin Philharmonic as given in Hunt. On Pristine Audio PASC 271 the live recording of the Violin Concerto was conducted by Furtwängler on Wednesday 12 January 1944 in the last concert he would conduct at the Alte Philharmonie, Berlin. In the substantial opening movement the splendour of the Berlin strings is evident right from the introduction with the orchestra exhibiting awesome power. Röhn is stately, resolute and assured with incredible control of the euphonious high register. This is graceful and tender playing - especially in the Larghetto. Again I was struck by the firmness of his technique. One can only imagine how soothing this glorious music must have seemed to the Philharmonie audience taking a short cultural break from the horrors of wartime Berlin. In theRondo: Allegro we hear the delights of Röhn’s rich deep register contrasted expertly with the dancing high notes. The way Furtwängler creates a thrilling doom-laden climax in the Coda is remarkable. Throughout the concerto Furtwängler provides support that is firm yet sympathetic to the soloist. Beethoven’s Symphony No. 5 in C minor, Op. 67 commenced in 1804-5 and was completed in 1808. It is one of the most famous works in the history of serious music. Beethoven dedicated the score to Prince Lobkowitz and Count Razumovsky. It was the thirty-eight year old composer himself who directed the première of the symphony at Vienna in December 1808. 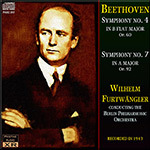 As listed in Hunt the famous Fifth Symphony was the work that Furtwängler conducted in performance the most frequently. Twelve times he recorded the score including eight times with the Berlin Philharmonic. One of those occasions was captured live on 30 June 1943 from the Alte Philharmonie, Berlin and appears on this Pristine Audio PASC 271 release. This is music of wide variation from scenes of majestic Tyrolean splendour to a dramatic sense of the sheer force of nature. Furtwängler provides an underlying sense of dark menace running through the complete performance. Right from the opening motifs enough power is engendered to shake the foundations of the Berliner Dom. Sheer bold muscularity firmly underpins proceedings. I was struck by the unity of the Berlin orchestra with rock-solid playing from all sections. I can image that Beethoven’s compassionate writing and sensitive playing of the Andante con moto brought a few tears to the eyes of many beleaguered Berliners in the audience. Furtwängler makes sure the starkly contrasting passages in Beethoven’s writing are given wholehearted energy. Brass fanfares in the Scherzo: Allegro exude confidence with textures that could have been hewn from granite. I found the timbre and effect of the low strings quite remarkable. The opening bars of the Allegro,Finale are quite magnificent in music that makes a great impact. Furtwängler’s imposing interpretation contains strength and power with a sure sense of urgency yet the music always remains firmly rooted. These two exceptional discs have real historical significance and capture the true greatness of these live performances.